Our Square Retro Diner Table 36×36 – Base is available in your choice of laminate, metal banding, and base. This configuration provides comfortable seating for four! Sturdy, durable, and built to last a lifetime! Choose from any of our standard laminates, or premium boomerang and cracked ice. There is a Lifetime Structural Warranty Against Manufacturer Defects on Metal Chairs & Barstools; Two (2) Year Manufacturer Warranty on Bases, Tables, Booths & Wood Products. Designed and made in USA. Commercial Quality – built to last! 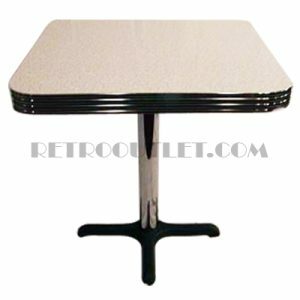 Please allow 4-5 weeks for production of our retro diner tables.